May 3 on Long Island – official new “Sweethearts” book release & party! OK, folks, it’s official! 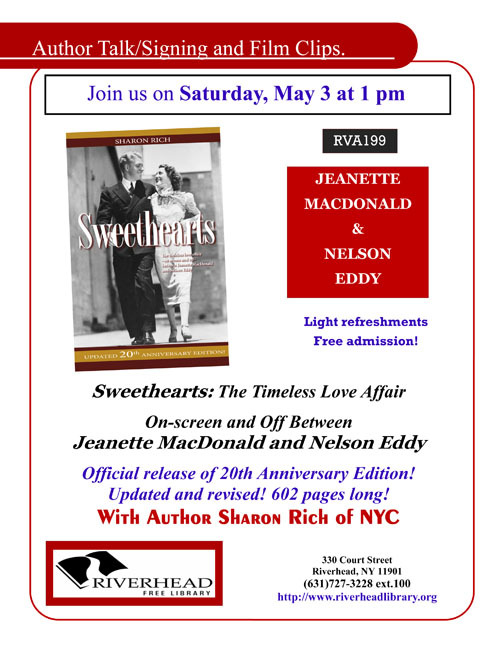 Join us on Long Island for the release of the new edition of Sweethearts! Admission: free. Light refreshments served. The afternoon will include the book signing, a talk and film clips shown. Come celebrate with us! Click this link to download the flyer as a PDF file. « May 1st TCM Mac/Eddy mini-marathon! » Join us in NYC on Saturday, June 7!